So it’s really chilly and windy out today. I hafta say that the very last thing I wanted to hafta do this morning was to get out of bed and go out, but I had to. I had no choice, as usual. At least I managed to find my Antennae Cozies so I could make it to my Editor’s Office this morning without having my Antennae freeze and snap off. (That would hurt. A lot.) I was still trying to warm up my Wings when I walked in and noticed he was standing there beehind his Desk, glaring at me. “About your over-use of ‘Great Grandma Gee Gee’s Royal HoneyChew Krisp Cookies™’ in your Observations, that’s what.” He sounded upset. “I don’t get it,” I told him, “you told me that every time I made an Observation, I had to mention Great Grandma Gee’s Royal Honey... ™,” except that I didn’t get to get to even saying the “Trademark” part beefore he interrupted me. “Are your Antenna frozen, bee? Did you not hear what I just said to you? Forget what I said, and listen to me,” he said, though at that point I was a bit confused about what I wasn’t supposed to bee listening to anymore, especially if he said it. But he kept talking anyway. 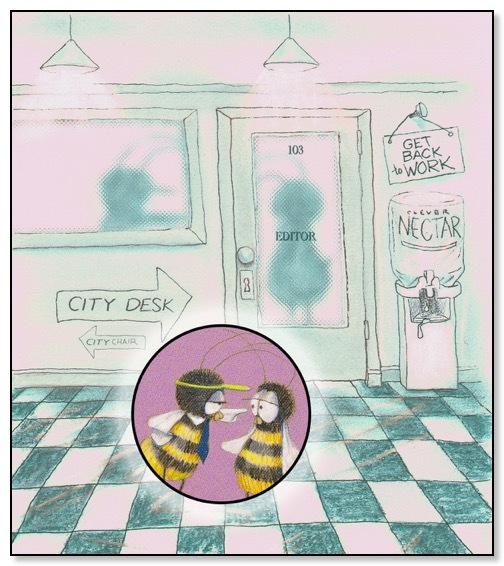 “You’re still not hearing me, bee,” he said, sticking his pointed Wing in my face. “FIX THIS - OR ELSE. Now get out of my Office.” So I did that. Oh geeeeeeze. How in the hell am I supposed to meet my Legal Obligation to mention Great Grandma Gee Gee’s Royal HoneyChew Krisp Cookies™ in every one of my Observations without mentioning Great Grandma Gee Gee’s Royal HoneyChew Krisp Cookies™? I wanna know. I mean, I don’t wanna annoy my Beeloved Readers, but I also don’t wanna make Great Grandma Gee Gee mad. Seriously. That would not bee a good thing. I gotta figure out what to do about all this, but I’m absolutely, totally sure I’ll come up with something, probably. So I’m gonna go do that.